According to a new market study published by Transparency Market Research (TMR), the global vitreous tamponades market will rise at a modest 2.50% CAGR from 2014 to 2020, reaching US$77.5 mn by 2020. The report is titled ‘Vitreous Tamponades Market - Global Industry Analysis, Size, Share, Growth, Trends and Forecast 2014 - 2020’ and provides a comprehensive analysis of the progress of this market for the client’s perusal. TMR analysts find that the vitreous tamponades market is witnessing a steady transformation over the past few years with respect to the state of the tamponade used, with conventionally used liquid state tamponades increasingly being replaced by gaseous state tamponades. Vitreous substitutes display elasticity and biocompatibility, which make these devices suitable as an intra-operative or postoperative tool for the correction of vitreoretinal disorders. Since the inception of modern vitrectomy techniques in the 1970’s, the utilization of vitreous substitutes to be used for healing of the retina has been on the rise. Increasing incidence of macular pucker, diabetic retinopathy, and other retinal disorders that require attentive care of the retina during the course of treatment is fueling the vitreous tamponades market. In addition, the increasing number of geriatrics, who are more susceptible to retinal breaks, in the world are augmenting the demand for vitreous tamponades for effective retinal care. The market for vitreous tamponades is divided on the basis of type and geography. Based on tamponade type, gaseous and liquid tamponades are the segments of the vitreous tamponades market. 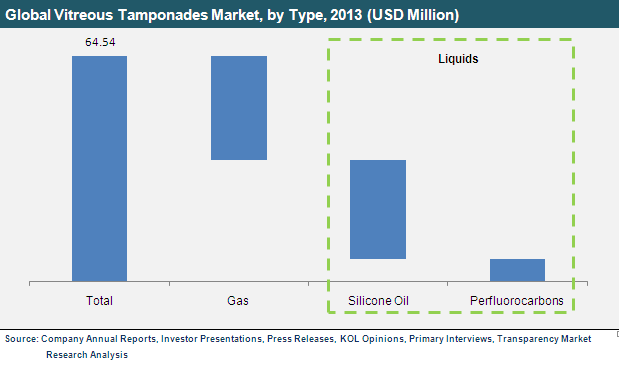 In 2013, liquid tamponades were the leading segment and accounted for more than 49% of the vitreous tamponades market. The dominance of liquid tamponades over gaseous tamponades is due to the widespread usage of the former in Europe and Asia for the treatment of numerous retinal conditions, such as giant tears, multiple break retinal detachments, proliferative vitreoretinopathy, and proliferative diabetic retinopathy, among others. Furthermore, liquid tamponades are sub-segmented into perfluorocarbon liquid and silicone oil, of which the silicon oil segment will exhibit the fastest growth during the 2014-2020 forecast period. However, in recent years, the use of silicon oils has been related to the development of some adverse conditions such as glaucoma and eye inflammation. This is due to the tendency of silicone oils to emulsify and form bubbles inside the eye, which has necessitated the use of high-viscosity silicone oil, which dissuades emulsification. In addition, the high cost of silicon oils in comparison with gaseous tamponades and the need for second surgery to remove the silicon oil will limit the uptake of silicon oils in the future. The other liquid tamponade sub-segment, namely perfluorocarbons, will witness steadfast growth due to their use for reattaching giant retinal tears.However, it is the gaseous tamponades segment of the vitreous tamponades market that will display the highest growth rate during the forecast period. Some of the key companies having a significant presence in the vitreous tamponades industry are Alcon Inc., Carl Zeiss Meditec AG, Fluoron GmbH, and Valeant Pharmaceuticals International Inc.